The artist creates poetic devices that draw from the casual discoveries of everyday life and personal objects. The artist first developed the idea for this piece after looking at a paper airplane and suddenly realizing that it forms the shape of a T when viewed head on. 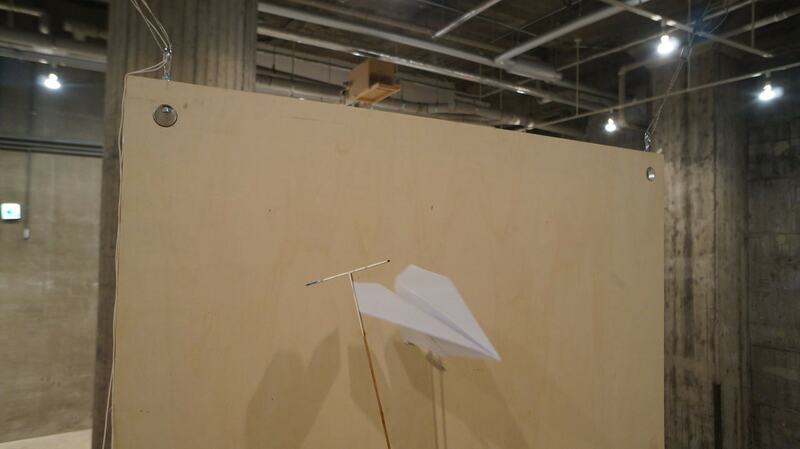 The paper airplanes slide through the T-shaped slits in the wall. The sight of the planes sliding through the obstacle in front of them, rather than colliding with them, will surely lighten the mood of the viewer. Born in Tochigi Prefecture in 1982. Casual discoveries from things around him and everyday life led him to make poetic installations with mechanical, optical and electrical methods. His “Ghost in the sellotape” which applies cellophane tape “shadows” to planets, won the Gold Award at the 22nd Ifva Festival (Hong Kong, 2017).